Liverpool tonight announced that 27-year-old Raul Meireles had signed for the club from FC Porto. Although there is never a guarantee that a player moving to English football will reproduce the form shown in his homeland the Portuguese international midfielder is seen as a very good signing for Liverpool. In what is a rare move the club have actually announced the fee. According to the official site he cost the club £11.5m (€14m) and has signed a 4-year-contract. No doubt the photos showing the player undergoing his “medical” will be released some time tomorrow. With Javier Mascherano in Barcelona to finalise his move away from Anfield the attention now moves to how the club will spend the remainder of the funds raised from that sale and also the money that should still be in the infamous ‘player account’ from deals already done in 2010. Liverpool have made a profit on transfer trading in each of the past three transfer windows and before taking the Meireles and Mascherano fees into consideration were still over £5m in profit in this window. Reports still vary on the fee Liverpool will receive for Mascherano but the suggestion now is that the club have sold him for up to £22m. Liverpool also allowed Alberto Aquilani to leave the club on a 12-month loan to Juventus earlier in the week. The Italian side have the option to make the deal permanent for a fee of £13.2m but even though Aquilani sees his Liverpool days as over there is no guarantee that Juventus will take the option up. That money should form part of next summer’s transfer budget, but there is an ownership situation to be resolved long before that. The profit from this year’s winter transfer window came from the sales of Dossena, Voronin and Mihaylov. Their departures brought the club a total of £8m in transfer fees. The only new signing in that window was Maxi Rodriguez, who arrived on a Bosman. Since then the club have signed Jovanovic and Cole on Bosman deals with Shelvey, Wilson, Poulsen and Jones being bought for a total of £10.55m. The fee for Wilson would rise substantially if he met the targets included as part of the deal, but those targets look to be some way off being met yet by a player signed for the future. Of course the club haven’t just bought players this summer. The departures of San José, Benayoun, Martin, Riera, Cavalieri and Németh brought in a total of £15.9m in from transfer fees. That means the club were in profit to the tune of £5.35m prior to the deals for Mascherano and Meireles. The net profit on those two deals is £10.5m, increasing the transfer profit so far this summer to £15.85m. Add on the £8m still outstanding from the winter transfer window and the new boss should be in the position to spend £23.85m in the next three days. It must be pointed out that every penny of that £23.85m would be from player sales. Not one penny would have been added from a share of the profits the club makes from ticket sales, TV money and commercial deals. The club made efforts to point out quietly towards the end of last season that there would be a summer transfer budget of £15m. Add that £15m to Roy’s potential kitty of £23.85m and the new boss should be in a position to spend £38.85m on new players before that deadline on Tuesday evening. Of course nobody expects that to happen – the club’s financial situation is not going to let that happen. But the club insist that all transfer fees received are reinvested as well as a share of club profits being thrown in every year. When reading the likely propaganda from the board later in the week about the levels of transfer spending this year don’t forget that even after signing our new Portuguese midfielder there should still be something near to £40m to spend on new signings in the next few days. One player that Liverpool seem to be making serious attempts to sign is PSV Eindhoven’s Swedish international striker Ola Toivonen. The Dutch side are reluctant sellers of a player who has made a significant impact for his club already this season and as a result will hold out for a fee that might be beyond the means of Hodgson. What makes it rather obvious that the ‘player account’ has a hole in it is the way Hodgson has been forced to wait for a player he has had lined up at least as long as he has been at the club. The failure to sell Emiliano Insua has meant Hodgson resorted to using promising teenagers Lauri Dalla Valle and Alex Kacaniklic as part of the deal to bring 29-year-old left-back Paul Konchesky to Anfield in a deal said to be worth £3m. The original plan was to use the proceeds of the sale of Insua to fund the bid, but the Argentinean youngster hadn’t asked for a move and has so far been unable or unwilling to agree personal terms for any move. Whatever unfolds over the next few days there is little doubt that Roy Hodgson is looking forward to that transfer window closing so he can get back to dealing with picking his team and working out his tactics without the distractions that come from his players waiting to see if their agent has called. But the closure of the transfer window isn’t the only deadline looming for Liverpool on Tuesday. That’s the loose deadline Martin Broughton put onto the process to put new owners in control of the club and is also said to be a deadline for RBS to carry out more action against the current owners. its funny they won’t give roy 23 million transfer kitty. £15.85m + 11m as promised. or if we have a kitty as u claim. we all know what the great people of liverpool fc have gone through, although I want born in liverpool, if you open me up i bleed the club, i do not get to every home game and i heep praise and respect on the real liverpool fans who travel all round the globe while we are being run into the ground by the greedy con men owners that we have. the transfer market for the last 3- 4 years has been a total disgrace and if like me you know the real true story and whats going on, unlike a sky sports / talsport anit liverpoo media driven stories that get printed then you will know and see what rafa and what roy is currently having to work with. sprus have spent over 140 million in under 3 years, city, well ther are in a different planet, man utd, even though sky keep saying they havent soent, well thats crap because they have spent close to 24 million, on what? over rated youth, nice of you have it!. arsenal have spent over 12 million without even having to sell! stoke spent 8 million on that useless player jones! yet liverpool have to shift out youth players, bring in free players, ship out 3 / 4 core first team players in order to try and get us to think we are are adding depth to our team. I soppose not having CL money would affect on the finances as will all the extra backroom staff employed last year plus the comings & goings, agents etc etc. I think what we really saying here is that we dont want Hodgson in charge, we don’t rate him, we don’t like him, he is a yes man & we want him gone. We want Rafa back at the club under a different board and owners with endless amounts of money to spend. I don’t really care how they do this year, actuallly I’m hoping they will fall flat on their faces because without Rafa there it just isn’t the same. Todd – What in any of the above says that “we” don’t want Hodgson in charge? I’m over the moon Rafa has gone and wouldn’t want him back even if the richest man in earth purchased the club and gave us an unlimited transfer kitty every year. Hodgson’s straight talking has been a breath of fresh air when compared to Rafa’ press conferences since his “facts” debacle. Rafa has gone, get over it and support the new manager! @ Mark – I’m not 100% certain but I’ve a feeling Todd might be being sarcastic. im really non-plussed by the insua saga- im without plus. is this cecil behind this? woy made some nice comments about him early on. and what a joke about the 12m “transfer kitty”- or as idiots like Chris Bascombe wrote, 40m at least because of the assured money from the Mascherano sale (we dont need two holding midfielders anyway, do we? cant afford the fee for a pretty mediocre left back. how did cecil get in the position he is in? and what going on with lucas? and maxi before that? strange and dark days with the two-headed hydra of cecil and eddy macia directing footballing matters. and we were awful today. i was in shock at how much possession we let the albion have in the first half. where was the pressing woy? As great a job as it is, when Rafa Benitez signed on to be Jose Mourinho’s replacement at Inter Milan, he had to know he would be living in the shadow of his predecessor’s brief but overwhelmingly successful reign. Benitez started the summer on the offensive by saying that his old nemesis from their Premier League days wasn’t the right man for the job at Real Madrid — a comment that surely did not go unnoticed by The Special One. And now, amid reports that Benitez has had every picture of Mourinho removed from Inter’s training ground, Jose has decided it’s time to remind Rafa who’s king. OOOPs I think I remember someone getting very hotheaded when it was rumoured that CP had done the same at melwood. As I said earlier on in the weekend, I’m always happy to read comments with views that counter my own as long as they’re constructive – and I’ve never got a problem with constructive criticism. From a quick check I’ve just made it seems your focus is on complaining about who writes a story not about what they write. And you still can’t get Rafa out of your mind for some reason. Rafa did enough good for this club for us to officially recognise that he did. He didn’t do enough “bad” for the club to cancel that out. So we should have photos of him around the ground in public and private areas in the same way, but to a lesser extent, as we do photos of his more illustrious and successful predecessors. He’s gone now though, and getting tangled up in argument after argument about whether he went for the right reasons or whether he alone was to blame for last season’s slump isn’t helpful to anyone. What he does at Inter is the business of Inter and their fans. What Mourinho thinks of him is the business of Mourinho, Real’s fans, Rafa and Inter’s fans. We can show some interest in it all but it’s not really our concern any more is it? What I will say is that if Rafa has removed those pictures because he doesn’t want to look at Mourinho every day that’s no surprise – he never pretended he liked Mourinho. Has CP ever been truly open and honest about how he felt about Rafa and how that had an impact on their working relationship? In fact was CP ever honest about the obtacles the manager had to work round and the extra obstacles he put in front of the manager? At least this season there’s finally some recognition that the manager of the club has a number of handicaps and that expecting him to be able to compete on an equal footing with the likes of Chelsea and Manchester United is a little over the top. If CP (or the club) puts extra obstacles in Roy’s way it should be okay for it to be raised by people who’ve spotted it without it turning into an argument of the type we had all too often last season. I say “should” – the problem is that some people just can’t get their heads around the idea that it’s possible to criticise people at the club without it being done as a defence of a manager who left three months ago. 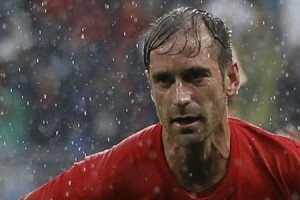 Raul Meireles é um grande profissional, vai encantar Liverpool. Felicidades Raul, boa escolha Liverpool FC. feel so lonely now eh kevin..can’t believe CP,Martin and those 2 yankee doodle got so many lovers like kelvin and his alike..